It can affect a young person’s, social life and self-confidence. Some All Stars struggle with their education, which can cause pressure and stress. Many struggle with social interaction and often feel judged or excluded. Some have been bullied because they are different. Some miss school because of their care needs. But all young people can grow and find enjoyment in a welcoming, understanding and inclusive environment and can seek reassurance and understanding from others in a similar situation to them. What do All Stars youngsters do? Making friends and meeting other youngsters in a similar situation. Experienced Sessional Workers who can provide support, advice and be a listening ear. When and where do All Stars Youngsters meet? All Stars Groups are funded by BBC Children in Need and are completely free to attend. Youngsters enjoy a free meal, free activities and free outings. Youngsters occasionally engage in fundraising activities to fund more outings or to purchase equipment that they may want. There are strictly limited numbers at all groups and therefore booking is essential. You will need to book your space here. We understand that youngsters will occasionally be unable to attend, we would ask that should this be the case that you contact us on 01823 475250 to cancel your place so that it can be offered to another youngster. The ability for an All Stars youngster to attend may be affected if they persistently book a place but fail to attend without notifying us. How do I arrange transport? BBC Children in Need have agreed to fund transport for All Stars youngsters living in Taunton Deane or Sedgemoor to attend their local group if they have no other means of attending. Funds are strictly limited so all requests are assessed on an individual basis. Please call 01823 475250 or email [email protected] if you have any questions. Does a parent or carer need to attend? We welcome a parent or responsible adult to attend on the All Stars youngsters first session so that they can be registered and we can learn a little about them and their situation. 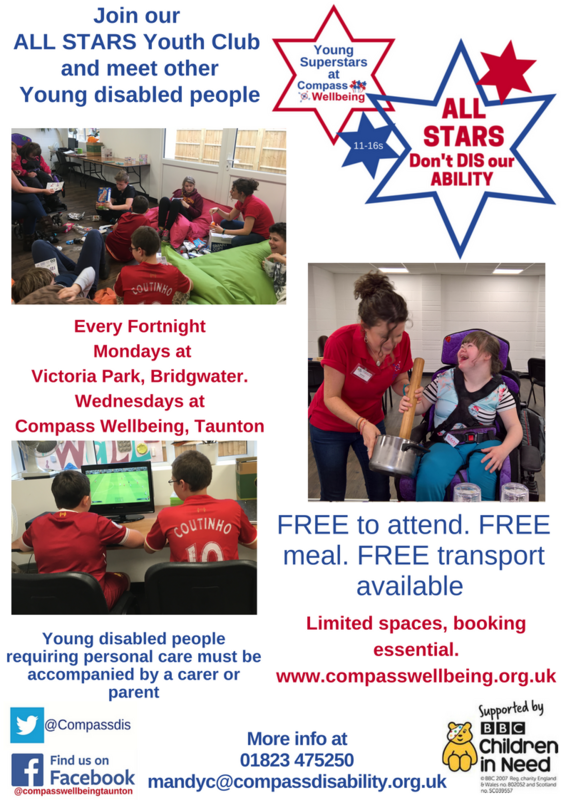 Any All Stars youngster who requires personal care, including feeding and toileting support, or who has significant behavioural support needs must be accompanied by a parent, carer or responsible adult throughout. We aim to improve All Stars youngsters’ confidence, social interaction and independence but we understand that some youngsters may want to be accompanied. This may only be for a few weeks whilst they grow in confidence and we encourage parents and carers to withdraw gradually at a pace that suits your youngster, after all you know them best. Withdrawing could just mean taking a seat in the café, whilst the youngster enjoys their time in the activity room or it could mean dropping them off and leaving them in the safe company of our experienced Sessional Workers, returning to collect them at the end the session. If transport is provided, and the All Stars Youngster is travelling unaccompanied, then we will make sure that a Sessional Worker is there to meet them and will ensure that they are safely into their arranged transport to return home. How will I know how things are going? When you register your All Stars youngster we will ask you to identify any concerns that you have about their ability to get involved, they may have specific access or communication needs, be shy, lack confidence or be anxious in social situations that are new to them. They may have behavioural issues that concern you or they may just be experiencing the usual rigors of adolescence. This will help us to work with them to make positive changes and provide any guidance that is relevant to them.